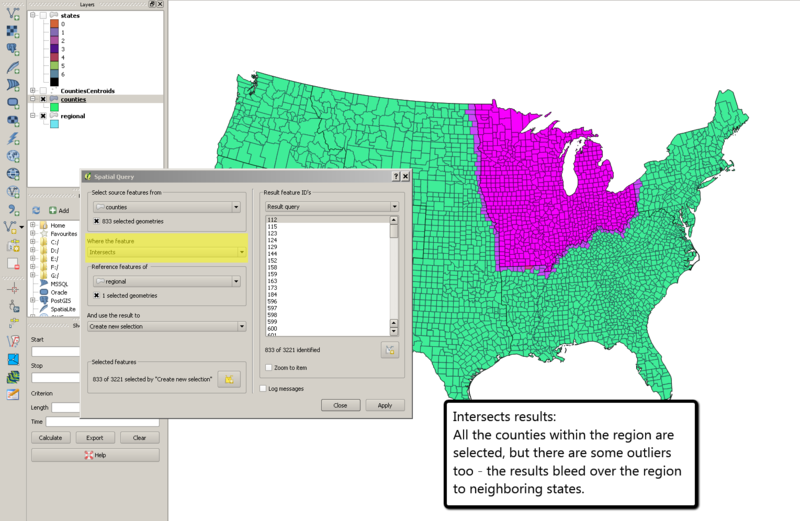 Selecting Counties within Region via Spatial Query using QGIS/PostGIS? I'm using GQIS 2.2 and PostGIS on Postgresql 9.3. I have 5 regions in the contiguous United States. Each region has states, and each state has counties. I would like to think that the data I'm given has each region, state, and county line up cleanly, but one can never be sure. 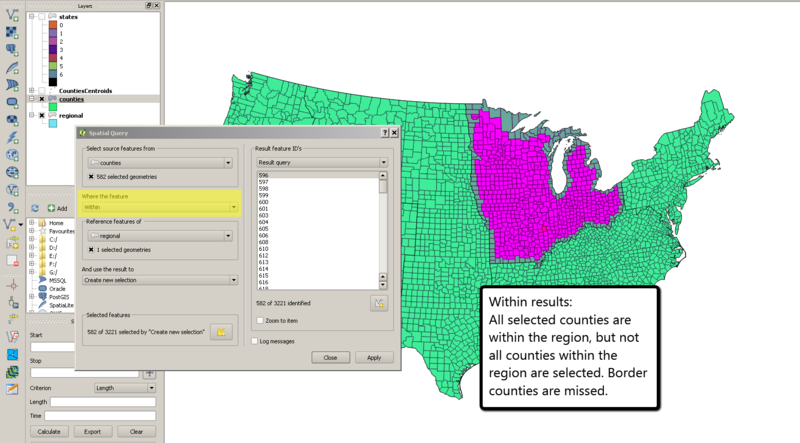 I'm at the point in the project where I need to select all counties within a region. Success is getting all the counties within a given region (say, the Upper Midwest). None of my attempts at QGIS or PostGIS give me the results I want. It may either be because my queries are poor (I'm a beginner), or because my data is dirty, or both. Here's what I've done so far: I've created PostGIS queries and also tried using QGIS's interface. Using QGIS's interface, we can see that ST_Within misses the border counties. 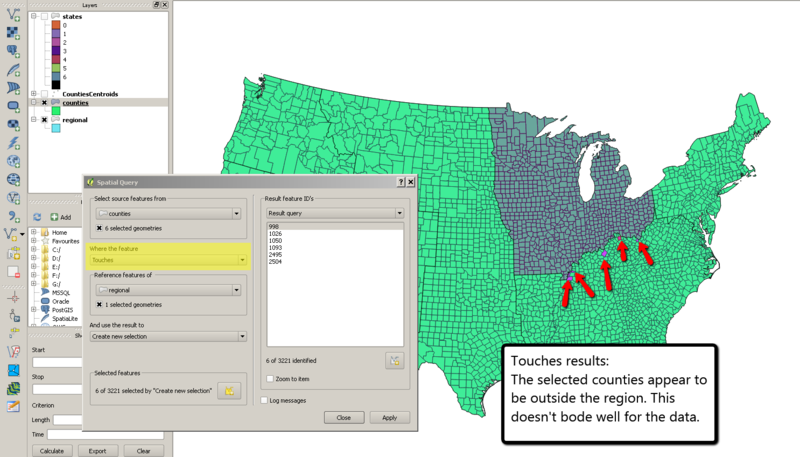 Touches seems to fail pretty badly - none of the counties are actually the counties that I want. They seem to be outside the selection! This is what leads me to think that I may have to clean my data somehow. Intersects is another step in the right direction, but it overselects. 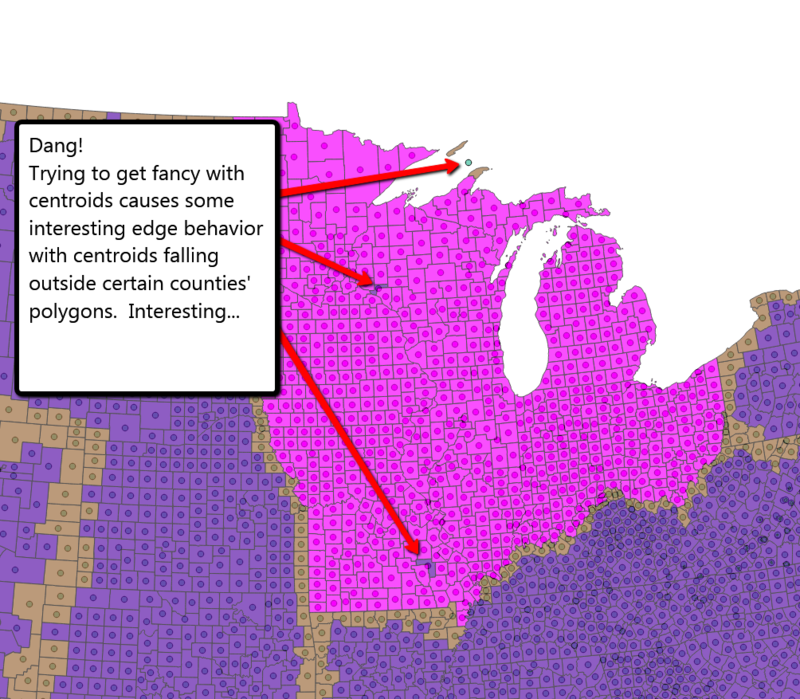 I also tried to get fancy using centroids, but I hit a few interesting edge cases involving centroids falling outside of county polygons and islands. I could always just use manual selection, but this seems like an interesting problem. If the problem is just of selection, then fine. But I think the real problem is that my data is off. I'm seeking any data cleaning techniques. I assume that I'm missing a general technique. I've read How to select by polygon in PostGIS with misaligned layers?, and while the solution was indeed very cunning, it doesn't strike me as solving the underlying problem. This will do a Centroid within query or a Point on Surface within query. This functionality in PostGIS is similar to the ArcMap GUI process of Select by Location with the spatial selection method being Have their centroid in. Not the answer you're looking for? Browse other questions tagged qgis postgis select-by-location spatial-query or ask your own question. Best way to figure out which regions a point is in a shapefile? Using Select Layer By Location in ArcPy? Leveraging capabilities of PostGIS for large (ish) tables in PostgreSQL? ST_ConcaveHull produces “No function matches given name” in PostGIS? Selecting points within buffer using PostGIS? 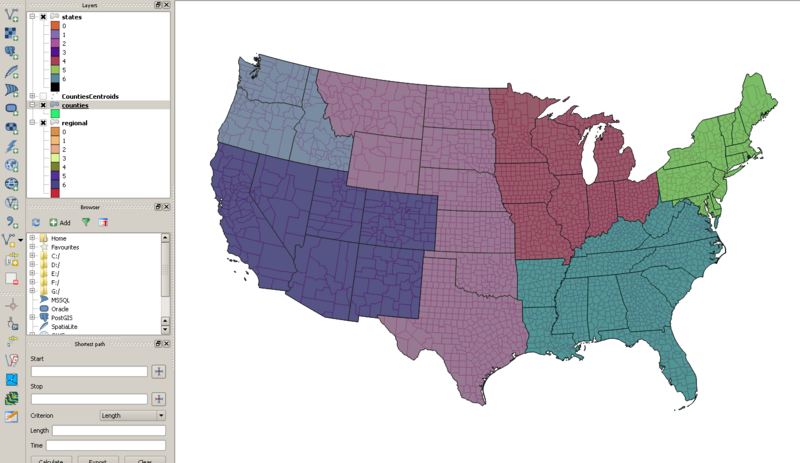 Returning US Census geographies within range of coordinate using PostGIS and Tiger Decoder? Selecting only portion of shapefile using ArcMap?